White sand going through your toes, sweet coconut water that costs less than a dollar, and a dazzling orange sunset that looks like it’s been photoshopped. This is real and it’s just one of the top things to do in Koh Samui, Thailand. And if you are lucky with the weather, this spectacle might repeat for as long as you stay on Samui island. It took us a few trips to the Gulf of Thailand to finally travel to Koh Samui, we visited Koh Phangan and Koh Tao a couple of times before. And yes, the third biggest island in Thailand is still worth a visit. 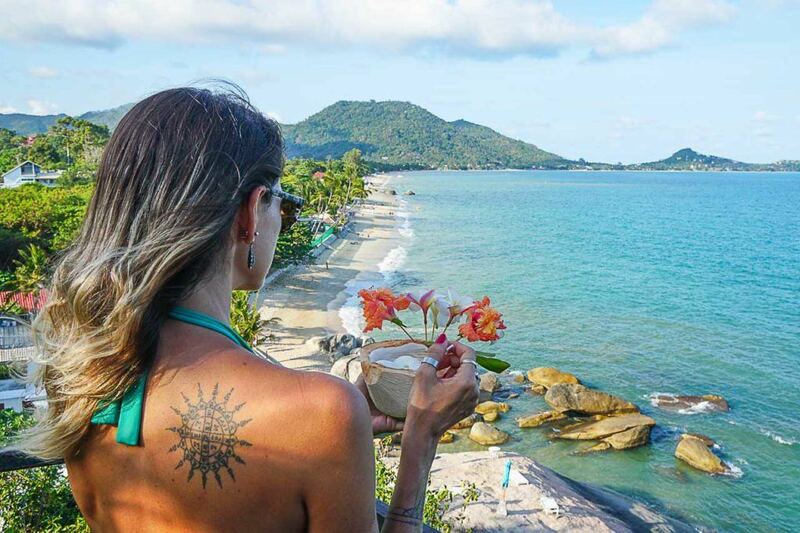 Among coconut trees, crowded streets, and crystal clear water, there is a handful of great things to do in Koh Samui, places to visit and unique experiences. Not to mention the big offer of places to stay in Koh Samui, from luxury resorts to friendly guesthouses and beachfront bungalows. So get ready to travel with us, discover what to in Koh Samui and why it’s one of the most visited islands in Thailand. One of the top things to do in Koh Samui is to stay in a resort in front of the beach or in a hillside hotel with stunning ocean views. To cross off this first item from your Koh Samui must do list, we’re gonna help you find the best place to stay in Koh Samui, from resorts to villas and local guesthouses. 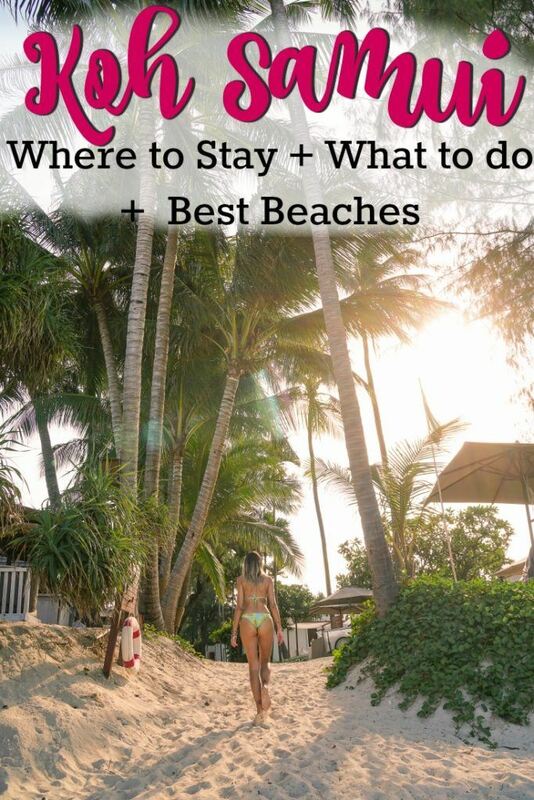 The best areas to stay in Koh Samui are: Chaweng Beach [good and busy beach, touristic town, lots of places to eat and party scene], Lamai [it’s like Chaweng, but less crowded], Chaoeng Mon [close to Chaweng, but more laid back, quiet beach, no traffic and no parties], Bophut [a fisherman village that became a trendy and sophisticated spot, the beach is not so good but the dining scene is 5 stars], and Maenam Beach [luxury resorts and budget accommodation, great sunset but far from the action]. 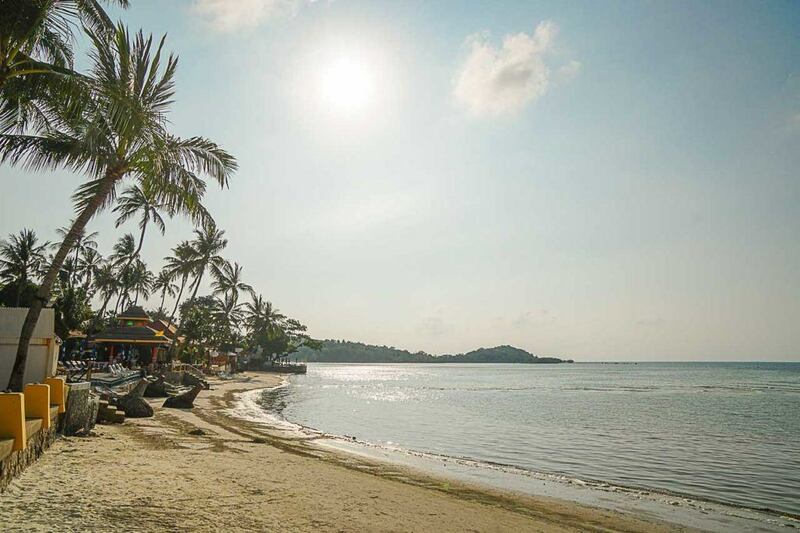 Of course, there are other areas to stay in Koh Samui, those mentioned are the most known ones, where the hotels are easily connected to the beaches and you don’t need to drive too far for food or fun. 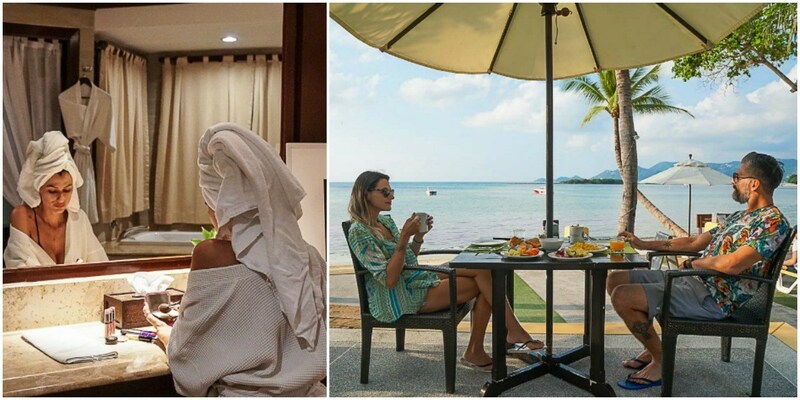 We chose two different places to stay in Koh Samui, the idea was to “test” the neighborhoods and also have an option of a mid-range hotel and a resort in Koh Samui to recommend to you. Novotel Samui Resort Chaweng Beach Kandaburi was the place we chose to explore the busy Chaweng Beach. It’s a beautiful beachfront resort with gardens that look like a natural park with flowers and fountains. Although it’s located in Chaweng Beach, it’s not in the middle of the action, 5 minutes by car or scooter and you are in the nightclubs, restaurants, and shopping area. 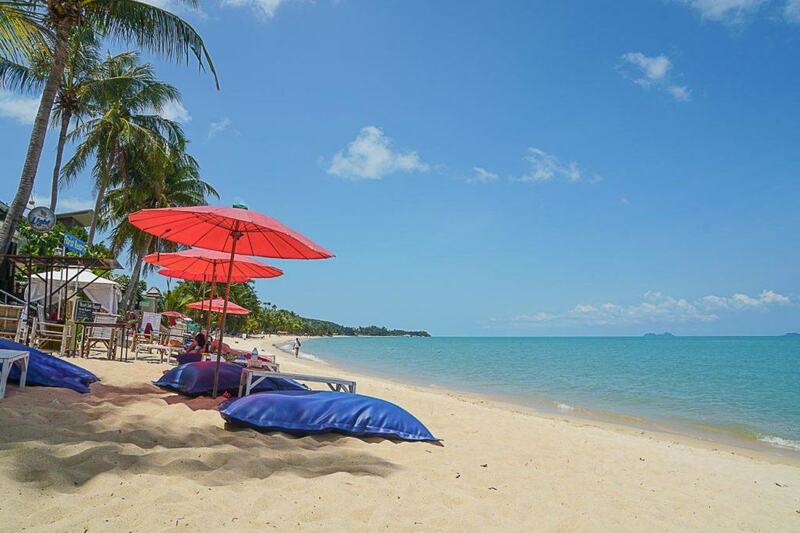 The beach in front of Novotel Koh Samui is calm, perfect for families or people who want to try water sports. We stayed in the Superior Room and it was huge, with Thai style décor, super clean, comfy and with an even bigger bathroom. But it was the restaurant facing the beach that I loved the most. Marvelous sunrise followed by a breakfast with sea view. The sunsets were beautiful too, a perfect match for a seafood dinner. If you are looking for a good resort in Koh Samui, Novotel is a great option. The service is great and the location is superb. If you want a more local experience, a good option is the Samui Makkala Resort & Pool Villa, the name sounds fancier than it actually is. The hotel is a small property at Chaoeng Mon Beach, it’s a Thai style hotel with big rooms, comfy bed and the basics you need for a good stay, including pool and breakfast. If you don’t want to spent too much it’ll probably fit on your travel budget. Just keep in mind that it’s a bit off from Chaweng Beach center and other attractions in Koh Samui, so to go out and about you will need a scooter, a bike or a taxi. Not sure if these are the best hotels to stay in Koh Samui? No problem, keep searching on Booking.com and Agoda for the best rates. Now that you already know where the best places to stay in Koh Samui are, hotels and resorts, it’s time for the fun. Our list of what to do in Koh Samui is long, but you can squeeze all the activities in 3 or 4 days. The island is big and if you want to get around to visit all the cool places in Koh Samui you’ll need to rent a scooter or a motorbike. No cars, unless you want to get stuck in the traffic. There is also the possibility to get taxis, they are everywhere, but again you won’t have the freedom to explore the island at your own pace. 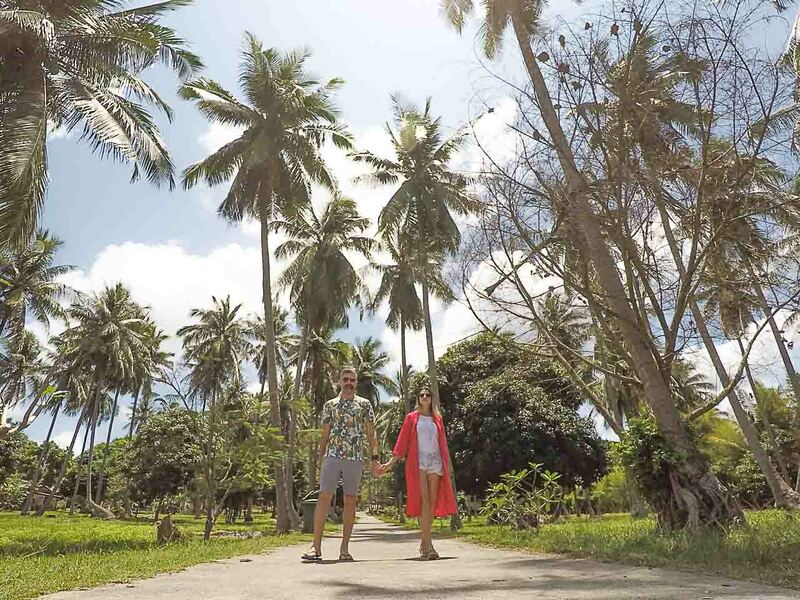 Bike and helmets on, it’s time to discover the best beaches in Koh Samui, and on the way, you’ll find great places to visit, to stop for a fresh coconut or for an awesome Instagram shot. From Chaweng Beach, if you go North and Northwest you must visit Chaoen Mon Beach, the Bophut village, and the crystal clear waters of Maenam Beach. Feeling adventurous? Go chasing some waterfalls! Search on Google Maps for Tan Rua Waterfall or Hin Lat Waterfall, they are on the way to Maenam Beach. On the following day go explore the South side of Koh Samui and its famous attractions. Talking about beaches, stop at Chaweng Noi [a small version of Chaweng Beach], then drive to the Coral Cove Beach, a small bay hidden behind a hotel entrance. Stay there for a couple of hours as it’s a great spot for swimming and snorkeling. Following the main road, you’re gonna find Silver Beach and, a bit further, Lamai Beach. By the end of Lamai Beach, you will find road signs pointing the direction to Grandfather and Grandmother Rocks. Once you arrive there it will be easy to spot a big phallic rock and another one with a hole in the middle. Those naughty rock formations have a story behind, something with sailing to Koh Samui, marriage and death. The place is beautiful and definitely one funny place to visit in Koh Samui. While most people stay there looking at Grandfather Rock, just a few pay 20 Baht to visit the Lamai viewpoint, which is just beside it. In my opinion, the view from the top is way more stunning. If the sun is still up, keep on driving because there are more cool things to do in Koh Samui. Near Lamai Beach, there are two waterfalls you can visit, Wang Sao Thong [the smaller one] and Na Mueng, a waterfall that is divided in two levels. You can go there for a cold swim, some relaxing trekking, but please, DO NOT RIDE ELEPHANTS! There is an elephant park close to the waterfall where you can go on a safari, pet and ride the elephants. If you are not aware of the cruelty behind the elephant tourism industry, please watch this video. Back to the coast, find your way to Laem Sor Pagoda, it’s a big golden pagoda sitting just by the ocean. When we were there it was under renovation, so we didn’t have a chance to see it, but the motorbike ride to the Pagoda was a great experience. The roads are empty, and you will be surrounded by endless fields of coconut trees, charming Thai houses, buffalos, and kids playing. It was the perfect way to end our afternoon ride. If you don’t want to drive that far to see Koh Samui’s famous coconuts trees, when driving to Maenam Beach pay attention to the surroundings and you might spot them there. Renting a scooter and driving around the island is one of the first things to do in Koh Samui, it will give you a sense of the place, the distances of things and then you can choose where you want to go back and stay longer. By the way, the price to rent a scooter is about 200 – 300 Bahts per day. 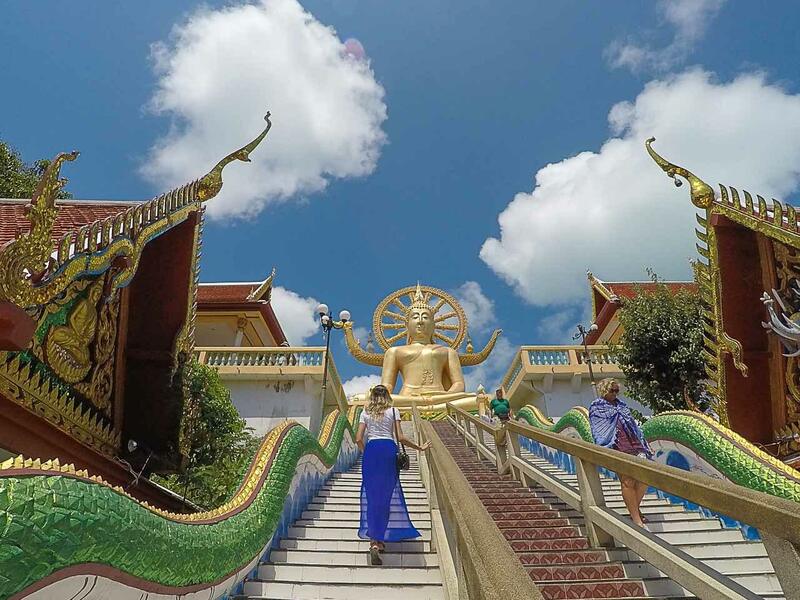 Built in 1972, the 12 meter seated Buddha statue is a part of Wat Phra Yai Ko Fan Temple and a visit there is one of the top things to do in Koh Samui. The place is beautiful, the statue is immense, and the views you get from there are awe-inspiring. The Buddha sits majestically on top of the temple and it’s surrounded by turquoise water. If you visit the Big Buddha early in the morning you might have a chance to witness the offering ritual and the morning chanting. It’s a religious place so act and dress respectfully. Shoulders and knees must be covered [for both women and men], but if you forgot about it, don’t panic. On the right side of the stairs that lead to the Big Buddha, there are sarongs and scarves for tourists, you can borrow one and give it back later. They don’t charge for it, but a small donation to the temple is appreciated. Koh Samui Big Buddha will give you a glimpse of the Thai Buddhism culture, if you want to learn more and visit other temples, there are a few very unique ones, worth seeing. You can search their location on Google and follow the map to Wat Plai Laem, Wat Khao Hua Juk [it’s on the top of a hill with an amazing view] and Wat Khunaram [where you can see a mummified Monk that died in 1973]. The pristine beaches are an invitation to spend the whole day soaking up the sun and discovering the colorful underwater life. Think about kayaks, jet skis, stand up paddle boards, snorkeling, diving, sailing… the possibilities are endless. On the island, you’re gonna find many dive schools offering fun dive sessions, or go on a day trip to visit beaches and smalls islands around Koh Samui that are perfect for snorkeling. Many hotels have kayaks and paddle boards, just rent one and have fun. 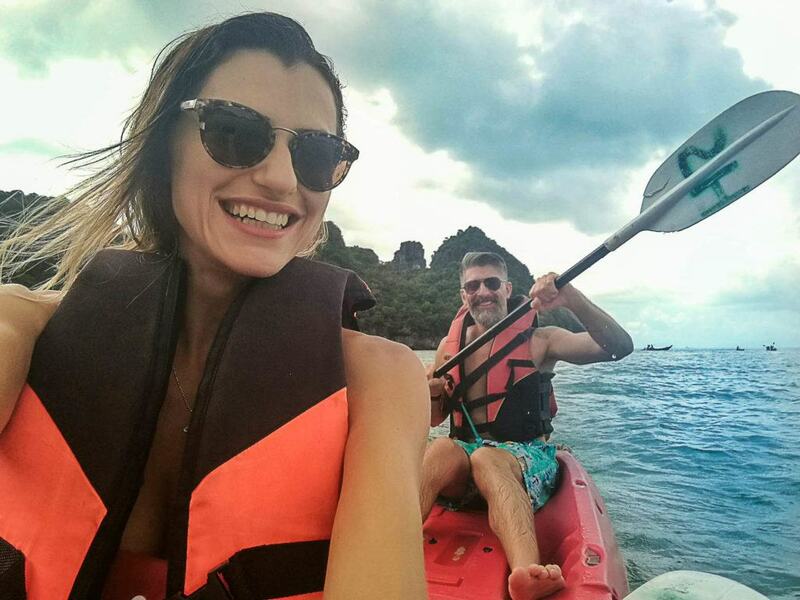 For sailing or jet skiing tours I suggest you to stop at one of the many tourism agencies on the island and ask for the price and the details, then book the activity that suits you best. There are many day trips from Koh Samui to nearby islands, but if you have to choose only one it must be a day trip to Mu Ko Ang Thong National Park. It’s a whole day sailing through the beautiful sea, passing by stunning rock formations and islets, visiting viewpoints and blue lagoons. It’s a freaking tiring and unforgettable day. Angthong National Park is one of the most beautiful marine parks I’ve visited in Thailand. We booked our day trip to Ang Thong National Park at the Loving in Samui travel agency close to Central Festival Shopping Mall, just beside a 7Eleven shop. The price was 1600 Baht per person and it included transportation from the hotel to the pier, the boat trip, a visit to Ko Wua Ta Lap island for some trekking to an impressive viewpoint, a delicious lunch on board, a kayaking adventure between islands, a visit to the Blue Lagoon and snorkeling at Ko Mae Ko beach. Water, fruits, and coffee during the trip and lovely staff that made our day with their jokes and smiles. 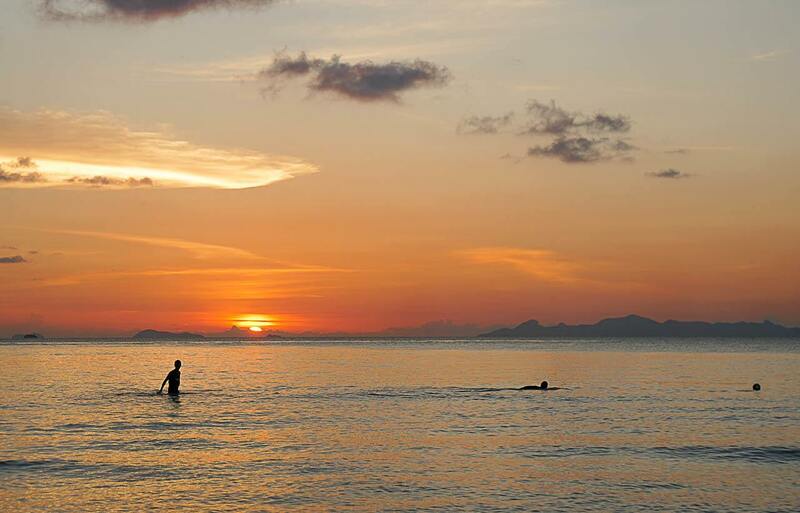 Our Koh Samui travel guide wouldn’t be complete without mentioning the stunning sunsets. The West side of the island is the best place to watch the sunset in Koh Samui, opposite to Chaweng Beach. Anywhere around Lipa Noi Beach, Nathon Town or Taling Ngam Beach will offer stunning views. You can get fancy and have sunset drinks at the famous Nikki Beach Resort, get funky at Think & Retro Cafe or just grab a beer at one of the many 7 Eleven shops and sit at the beach for an unforgettable sunset. The way up to the hotel and restaurant is tricky, especially if you are on a bike, but the views and the food are worth it. 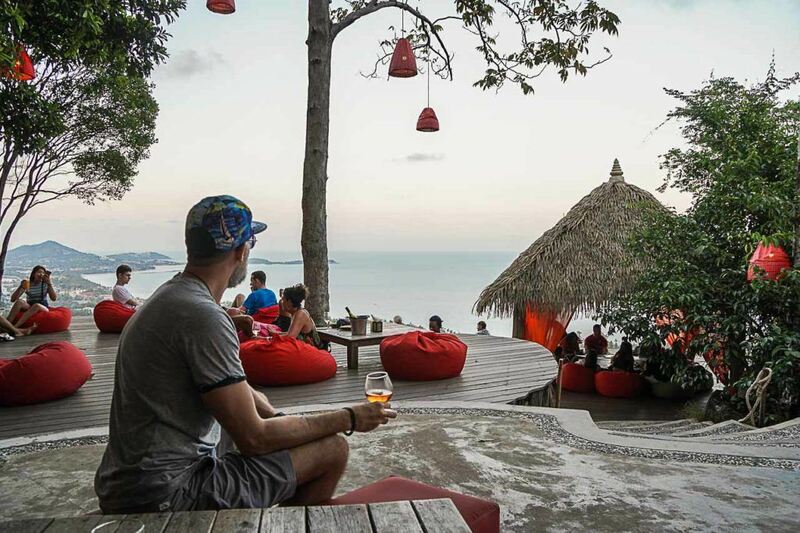 Many people go to Jungle Club for sunset drinks, but to be honest it’s not the best spot to watch the sunset in Koh Samui, as it is facing Chaweng Beach. The best light and views are during morning and afternoon. The place is beautiful, the staff is friendly and they have a great selection of drinks and pizza. I’m sold! At night time Koh Samui´s fisherman village becomes a hip chic/bohemian place to go. All the beautiful restaurants and bars get lit up, fire shows will be going on at the beach, and candles set the mood for the outdoor tables. Dining in Bophut is an experience itself and definitely one cool thing to do in Koh Samui. Seafood is a must try in Koh Samui! It doesn’t matter which restaurant you choose, if you go for a fine dine or a local one, in a hotel or at the night market. The seafood there is fresh, delicious and cheap. The prawns are gigantic and all the dishes I’ve tried were superb. The all you can eat BBQ Seafood at Novotel Koh Samui was fantastic and it’s open for guests and the general public. It’s a good idea if you want to dine good food under the stars in a quiet atmosphere. We also tried some local restaurants by the road and in all of them, the food was delicious and spicy. Don’t be afraid to try, in Koh Samui many people speak English, stop at a food stall and be ready to eat a feast. 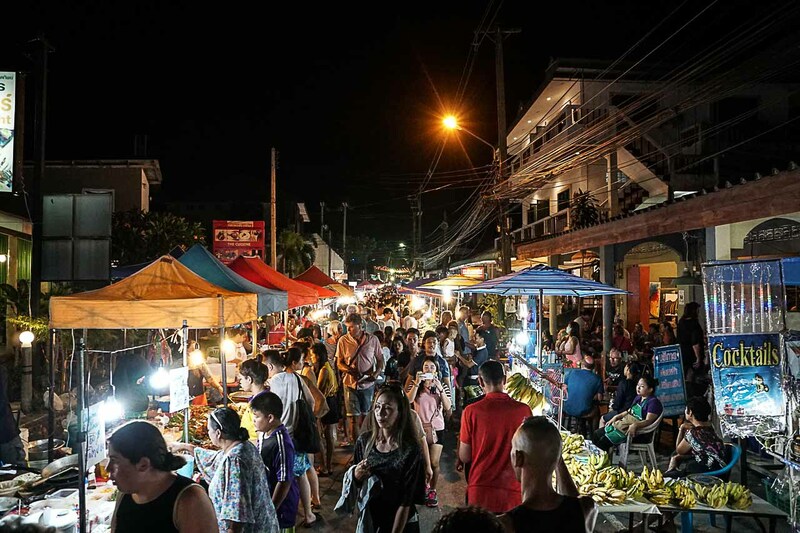 There are many street markets in Koh Samui, the most famous ones are Chaweng Night Market and Walking Street, and the Lamai Night Market. We loved Lamai market, it was busy but more traditional, more charming and more interesting than the one in Chaweng. Go there with an empty stomach and try all the local dishes. Order some food from the street vendors and walk to one of the bars and restaurants, as long as you order a drink you can sit and have your meal, no one will bother you. Another way to learn authentic and delicious Thai recipes is attending a cooking a class. I’ve attended a cooking class only in Phuket, so I can’t recommend a specific cooking school in Koh Samui. My advice is to search for Koh Samui Cooking Classes on TripAdvisor and choose the one with best reviews. Sports fan can watch a traditional Muay Thai fight at Phetch Bancha Samui Boxing Stadium. Not sure when and what time? Ask around or wait for the Muay Thai car to pass by your hotel announcing the next fight through the huge speakers. Nightlife in Koh Samui is diverse. There are beachfront clubs playing Hip Hop, RnB, EDM, House and even Techno music. The most famous beach bar/clubs are Ark Bar and Cha Cha Moon, where you can dance the night out. Around town there are plenty of bars serving anything from cheap drinks to elaborated cocktails, it all depends on your taste and budget. You can walk around and check the Soi Reggae [famous for the music and laidback crowd], Soi Green Mango [famous bar for Thai whiskey and the girls], and Soi Bar Solo [a busy spot for drinks and sports events]. If you are staying at Lamai Beach, the Beer Bars Plaza is a good option for a few drinks and some talk. For a fancy option with one of the best views on the island go for a cocktail at the Woobar in the stylish W Koh Samui. It doesn’t matter what your style is, part of the fun is going out, try different spots and discover Koh Samui´s nightlife by yourself. Feeling artistic, stunning and burlesque? Go for a night out at one of Koh Samui´s Ladyboy Cabaret. Leave your prejudices outside, sing and dance along some of the best hits from the 80’s and 90’s. Just thinking about a night out in Koh Samui makes you feel even more tired? Than a spa or a good Thai massage is what you need! Check if your hotel has a spa, or walk to some of the massage parlors near you. On the menu, you will find the traditional Thai massage, oil massage, foot scrub and many treatments to pamper your body and soul. We are done with our suggestion of things to in Koh Samui and places you must visit. It was a long list, but now you have all the info you need to plan your trip. To finish our Koh Samui travel guide, here goes some practical info about how to get to Koh Samui, the best time to visit the island and how long you should stay in paradise. Samui is the biggest and the most developed island in the Gulf of Thailand. Getting to Koh Samui it’s fairly easy and you can do it either by air, by air + boat, by train + boat or by bus + boat. You can fly to Koh Samui from many domestic and international destinations within Asia and Southeast Asia. 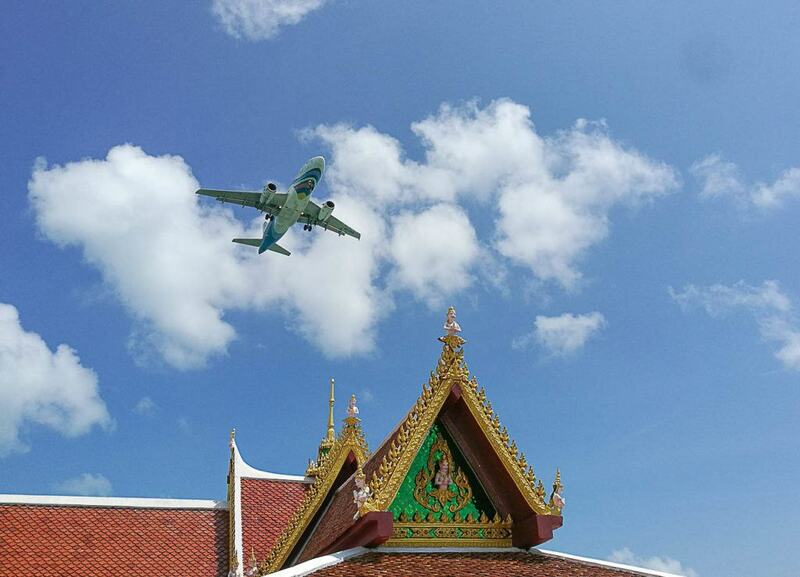 There are daily flights from Bangkok to Koh Samui, and from other major cities as Chiang Mai and Phuket too. Koh Samui airport is located close to Chaweng Beach and it’s a private airport, that’s why the flights to Koh Samui are usually more expensive than to other destinations in Thailand. A cheaper way is to fly to an airport close to Koh Samui, but still in the mainland, and from there getting a van to the pier and a ferry to the island. This is the famous ‘joint ticket’ that you will find all around Thailand and to any destination you can possibly think about. AirAsia and Nok Air offer joint tickets from Bangkok to Koh Samui [we flew with them], you buy one ticket and they take care of everything. It’s an easy and cheap way to get to Koh Samui. Usually, from Chiang Mai, Phuket, Krabi, Hat Yai or Bangkok there are daily flights to Koh Samui. Use Skyscanner or Kiwi.com to search for the best flights from Bangkok to Koh Samui or from any other destination. Again, the joint tickets are the best way to go, and we always buy them from 12GoAsia, a website that gathers all the train, buses, vans and ferries services in Thailand. It’s easy to use, super safe to buy and it’s all in English. You can buy all the tickets by yourself at the bus/train/ station, pier or at a tourist agency, but then you need to negotiate, there is the language barrier and if the bus or train is delayed you gonna lose your next ticket. On the 12GoAsia website, you can see the photos, and read the reviews before booking. Another golden tip: book a night bus/train to Koh Samui, so you save time when traveling. That’s an easy answer, there is no bad time to travel to Koh Samui, but definitely, there are some months that are better than others. The best time to visit Koh Samui is when it’s dry, sunny and not so hot: January, February, and March. April and May are the hottest months. We traveled to Koh Samui in mid-March, it was beautiful, but it was already getting too hot. Avoid October, November, and December, the rainy months. June, July, August, and September are low season, it will be hot, it might rain, but the island is quiet and things are cheaper. How long should you stay in Koh Samui? When it comes to spending time in the Thai Islands, the more the better! But if you only have a few days to travel around Thailand then I would recommend staying in Koh Samui for at least 3 nights. 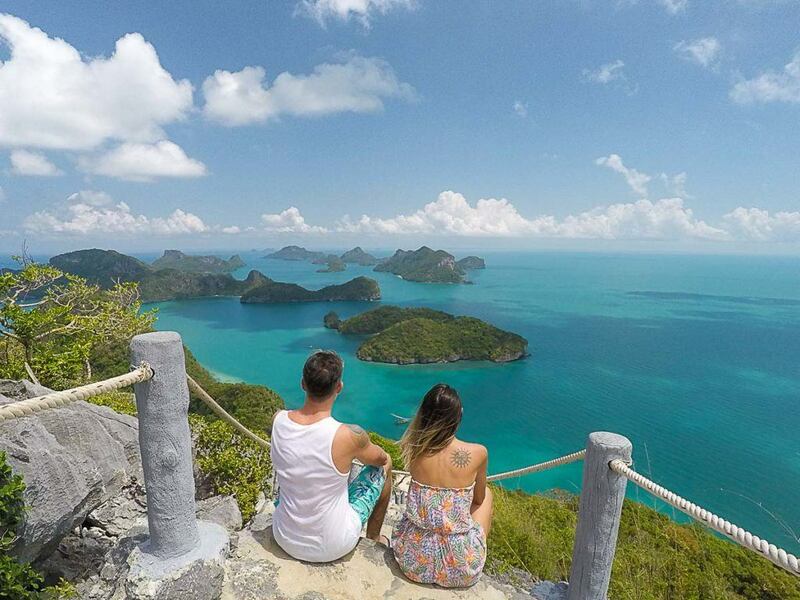 This will allow you to explore the island and check out some of the best things to do in Koh Samui, visit a few beaches and maybe go on a day trip to the beautiful Angthong National Park. Or if you prefer, stay by the beach sipping cocktails and watching the beautiful days go by. It’s a beach holiday, enjoy it as you like! Need more information and travel tips to Thailand? We have you covered! On our Thailand Page, you can find guides and blog posts about many cities, islands, beaches and local experiences. I wonder why Koh Samui famous of the most expensive island in Thailand, do you find it so? Not really. In Samui you have options for all budgets. Is it safe to travel to Samui? What’s your suggestion for large size family travel with people from different age group( like 13 to 87 years old? I found Thailand safer than Europe and WAY safer than South America. One thing that would make your trip smoother is to have a van & driver, this can easily be arranged by your hotel concierge. You can arrange the transportation with your hotel reception, get a taxi to the beaches (use Grab Taxi app, we love it) or if you drive, you can also rent a car. The island is big so to explore all the beaches you will need to get around by car or motorbike. About the sea kayaking, my recommendation is to book a day tour to the Angthong Marine Park and do kayaking there, it’s stunning.